Hey everyone – Jamie here! I just got home from a two-week-long adventure in Europe with family and friends. I am so excited to share my Rome food guide today! Keep on the lookout for more blog posts and vlogs from our trip throughout the South of France and Italy. Some of you may remember that Shir and I visited Rome together during our summer studying abroad. I also separately visited this ancient city with my family in high school and did all things touristy, which is definitely necessary on your first trip there; however, for my third visit I focused on finding the best local food! 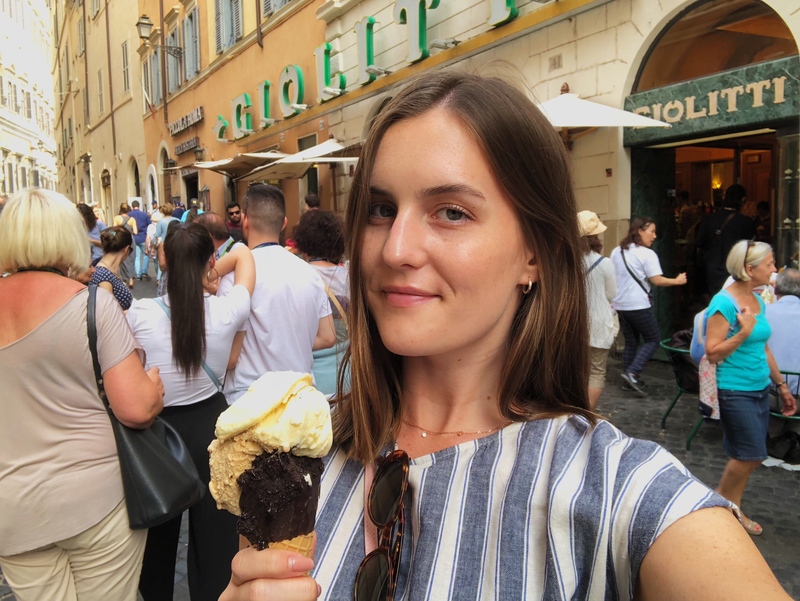 I have to point out that my family and I did this food tour through Rome’s Jewish Ghetto, which I highly recommend if you’re with a big group and have a free night! There are a few spots on the tour that I’ve included in this review, as well as some other favorites that are a bit off of the beaten path! This was our first food stop in Rome! After we flew into town, we were looking for something quick near our hotel and this was the perfect place. It is an organic cafe and features great smoothies, juices, sandwiches, salads and more! All of the walls in the cafe are stocked with great organic snacks and fruit – you know I stocked up! We all got sandwiches for lunch with traditional Italian ham and another day I got a smoothie to go. I recommend this spot if you’re looking for a quick breakfast or lunch, or if you’re just looking for a little health kick after so many carbs! For those of you who don’t know, I have a cousin on my mom’s side, Sydne Rome, who moved to Rome when she was my age to pursue a very successful acting career. She has lived there ever since and this was our first time visiting her in her home town! She invited us for a typical Roman Sunday lunch at this wonderful restaurant about a 15 minute drive outside of the heart of Rome. She reserved a table outdoors and all around us were large tables of families and NO tourists – it was so cute and the food was authentic and delicious! We all shared several different plates of appetizers, entrees and desserts (not all pictured below). If you’re traveling in Rome with your family, I highly recommend making a Sunday lunch reservation here. This was one of the first stops on our food tour and is one of the oldest bakeries in Rome. They specialize in pizza, but we also noticed the delicious-looking pastries sitting in the window! We tried the Margherita pizza and their special sparkling water, which fizzes purely from minerals. If you’re looking for traditional Italian pasta, this is your place! Da Pancrazio is a very unique restaurant because it is located in the ruins of the oldest theatre in Rome. Although not all of the ruins of the theatre have been uncovered (they’ve only found one story out of three! ), it is pretty amazing to be able to dine here because this is in the vicinity of where Caesar was killed! Other than the historic significance, I recommend sharing several of their incredible pastas with a group. If you need a break from the Italy’s pasta galore, this is your place! I visited Ginger for lunch and it was any health foodie’s heaven – they even have a whole BAR of fruit! I recommend trying their salads, which are actually bigger than your head! I also got their fruit platter to go to save for breakfast the next morning and it was wonderful. Next time I definitely want to try their acai bowls and smoothies! This was one of the last places we visited in Rome and was recommended by my cousin. It has a pretty traditional Italian menu and is casual and convenient. The wait staff are all very talkative and wonderful. I recommend sitting outside for a nice view! Giolitti’s is known to be an extremely popular gelato and dessert spot and let me tell you this place is BUSTLING! You know it’s going to be incredible when there are a million people in line… But here, the line moves quickly due to their setup of a line to buy a ticket of what size/how many gelatos you are getting and a separate line to order the gelato. Whenever I get gelato, I always ask the employees what their top 3 flavors are – that’s how you know you’re getting the best! Their top flavors were pistachio, stracciatella, and “chocolate chocolate” and they were all AMAZING! I also got the cinnamon and my mom got the whipped cream on top and she said that it was delicious. I’ve never been a fan of pistachio before, but this was incredible… this gelato was so good that we went twice in one day! I fell in love with this gelato shop when Shir and I visited Rome during our summer studying abroad. There’s always a huge line out the door – that’s how you know it’s good! I recommend trying their “frigidarium” flavor – I’m not exactly sure what it is, but it tastes chocolatey and sweet! Their second most popular flavor is stracciatella (cookies and cream). Oh, and you MUST get it dipped in their dark chocolate! This is sort of like a chocolate turtle that hardens over the gelato. It does make a mess once it melts but it is TOTALLY WORTH IT! P.S. – Right across the street there is a fun Irish bar and on the other street across from Frigidarium there is a pizza place that I haven’t tried but was recommended by a friend! If you’re a fan of tiramisu, definitely check out this place! I only had the time (and the room) to try their classic tiramisu flavor, but it was great. They also offer a variety of other tiramisu flavors.